In Texas, Red Cross training is designed to meet the needs of our communities and help those who live here learn new skills and prepare for emergencies of every size. Whether you're a parent or teacher, a teenager or senior citizen, concerned citizen or healthcare professional you'll find Red Cross training in Texas that's designed to suit your needs and your learning style. When you choose in-person AED, First-Aid and CPR classes in Texas from the American Red Cross, you'll join others from across the area for training from experienced, licensed professionals. Part lecture, part hands-on skills session, our in-person classes give you plenty of time to ask questions and become comfortable with the processes and procedures involved when providing care. At the Red Cross, our Basic Life Support (BLS) classes in Texas are taught by experienced professionals who can help you deliver high-quality care in an emergency. And with dozens of Texas BLS training sites, chances are good that you'll find a location that's convenient to wherever it is you call home. Explore our list of available classes and earn your Texas BLS certification from the American Red Cross. 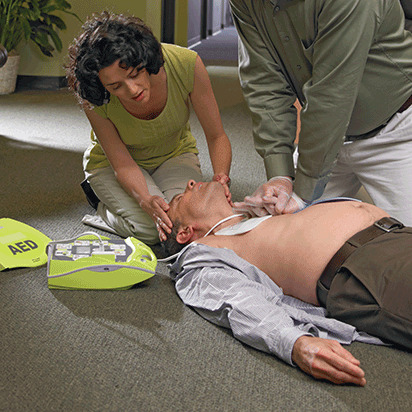 The American Red Cross offers a variety of ways to complete your BLS training in Texas. From classes designed for healthcare providers and first responders, to courses developed specifically for your department and your local protocols, we can help you earn the certification you need. Regardless of how you train, our BLS curriculum includes all of the standard scientific learning objectives necessary in professional resuscitation courses, as well as sections on teamwork, critical thinking skills, reflection and debriefing. Texas AED training from the American Red Cross can help you learn the skills that can help save a life. On average, first responders arrive on scene 8 to 12 minutes after 911 is called, however during sudden cardiac arrest, each minute that defibrillation is delayed reduces someone's chances of survival by approximately 10%. By taking AED classes in Texas you'll be prepared to help when it's needed you most. In-person Texas AED certification classes from the American Red Cross are taught by experienced professionals who can help you understand how and why to use an automated external defibrillator. Throughout the lecture portion of the class you'll learn "theory," and have ample opportunity to ask questions. During the skills session, you'll learn how to use AED devices properly and will receive personalized instruction to ensure that you understand all of the procedures. Take babysitting classes in Texas from the nation's leader in babysitting and child care training. With best-in-class in-person and online courses designed to help you keep kids safe, understand and manage behaviors, choose age-appropriate activities, and more, our experts can help you become one of the most in-demand babysitters in your neighborhood. Be prepared to help. When you sign up for first aid classes in Texas from the American Red Cross, you'll learn the latest science and techniques for providing care during times of need. Available online, in person and via our blended Simulation Learning experience, which combines online coursework with in-person skills sessions, our first aid training can help you save a life.